This is an updated waterfront house on Badin Lake, bordered by the Uwharrie National Forest and Badin Lake Recreation Area, with Mt. Morrow State Park a short drive away. There is a gorgeous view from the brand new screened porch - often called a million-dollar view! You can experience beautiful sunsets, wildlife, and the lake view which includes several forested islands. Each day enjoy that first cup of coffee from the screened porch where you are likely to see herons and other waterfowl, fish jumping, and an eagle or two. Better yet, use the two kayaks that are available for your use and get out on the water and enjoy the wildlife up close! If you have a boat, there are boat whips to tie up at the pier. Take a swim right from the dock - there is a ladder that makes it easy to get into the water. Use the sun deck for sunning and relaxing. Later on, from the waterfront deck, enjoy sitting in the Adirondack chairs and watching those sunsets. When it's time for dinner, you can cook on the gas grill and then enjoy your meal on the porch. If you happen to have a rain shower, you can still enjoy being outside on the porch, and for cool evenings, there is a patio heater to keep off the chill. There are games, movies, puzzles, and cards and even a basketball goal provided for your stay. Come for relaxation and play, enjoy the awesome views that await you, and we know you will wish you did not have to leave at the end of your stay! The first time we saw the incredible lake view here, we knew this was the weekend home that we just had to own. Badin Lake is one of the most beautiful lakes in North Carolina. Although we travel often, we always look forward to coming back to our lake house. This home on the water has given us so many happy memories that we would love to share the home with others so that they may also make memories of their own here on Badin Lake. A treadmill is located in a lower-level room (room is also used for storage). Outstanding home away from home! This gorgeous property is impeccably decorated, spotlessly clean, and includes every convenience and amenity you could ever need. During our weekend stay, we hiked the Badin Lake trail and did some kayaking. But my favorite activity was enjoying the breathtaking view from the screened porch! We enjoyed our long weekend stay at this beautiful home that is comfortable for relaxing inside or out. The view from the living room and from the screened porch (with a great heater for colder months) has to be one of the best on the lake. The beds are very comfortable and the house is clean and includes everything needed to prepare meals. I hope to return soon to take advantage of the dock and outdoor spaces! All of our questions to the owners were answered very promptly. Thank you! Great property with great views and very nice furnishings! This was a very nice property and I am glad we stayed here. There was some bad weather after checking in due to a storm and we did lose power. The house does have a generator, however it didn't turn on as it should have. The owners were very responsive and did try to walk me through getting it turned on. The fix was a little more complicated, so the owner came over while we were out hiking and got everything squared away. They were very generous and gracious and I would definitely recommend staying here if you have the chance! Was a great escape for us! There were only 2 of us but plenty of room for a family of 5. Well equipped kitchen and outdoor gas grill. Beautiful sunsets! Would stay again! Literally, the best view of Badin Lake! My family and I had an absolutely FANTASTIC vacation at this comfortable and cozy house on Badin Lake. 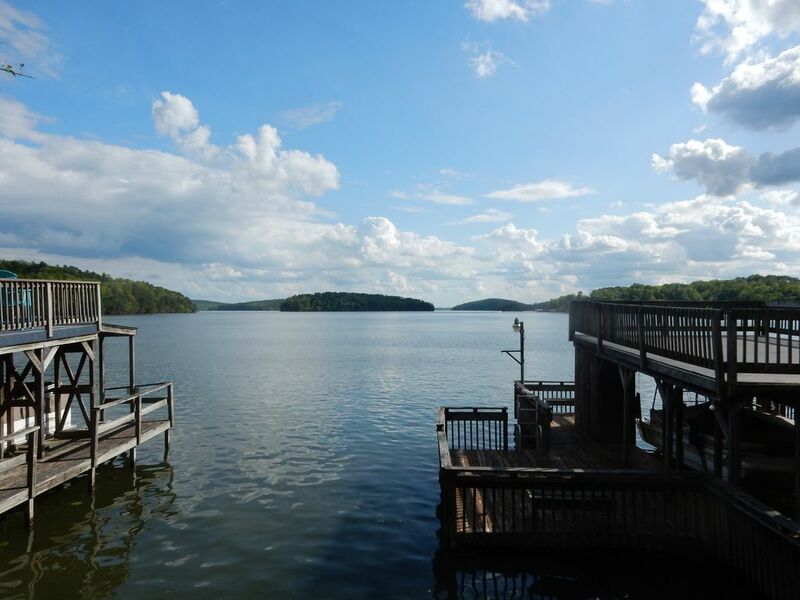 As described on the listing, it literally has the "best waterfront view on Badin Lake!" The house had all the furnishings and accommodations we needed from kitchen gadgets, linens, paper products, books, and movies. We barely had to pack anything but clothes and food. We were easily able to cook family meals in the kitchen, grill out on the deck, watch college football, and sit on the screened porch for beautiful sunrises and sunsets. The property had plenty of parking space for three cars and our boat. The boat ramp was barely 1/4 mile away, so we could launch our boat with ease for a day of fishing or just cruising around the lake. If we wanted to stay around the house, we could launch the provided kayaks at the house's dock or just fish from the bank. The house is centrally located to many attractions including the Capel Rug Outlet in Troy, the many pottery studios in Seagrove, the North Carolina Zoo in Asheboro, Morrow Mountain State Park, and the bi-annual antique festivals in Liberty. This property was perfect and we can't wait to come back! Thank you so much for a great stay! This lovely house on Badin Lake was the perfect get-away. It exceeded our expectations and the views from the screened porch & living room are exceptional. A well equipped & lovingly decorated home, made for a memorable stay. I am reluctant to expound on the many fine qualities of this Lake property - since it may hinder my ability to rent again - if it becomes too popular. So I will leave it at - "We were Very Pleased"
Badin Lake, with its rural setting, provides numerous opportunities for participating in an abundance of outdoor activities, such as cycling, playing golf, hiking, fishing, kayaking, jet-skiing, tubing, water-skiing, and swimming. North Carolina Zoological Park in Asheboro is 30 minutes away. Morrow Mountain State Park is also 30 minutes away. Shopping and restaurants are located in Albemarle and Asheboro, each a 30-minute drive from the rental property. Rates are subject to change prior to a confirmed booking. The rate for Christmas week is $1800. Inquire about details.